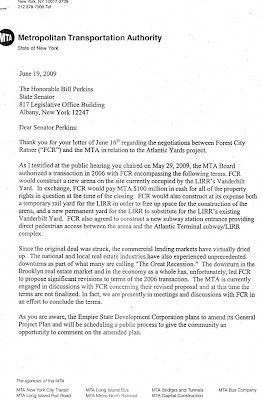 A representative of state Senator Bill Perkins was not overstating the case when he testified June 24 that the Metropolitan Transportation Authority (MTA) had essentially ignored a letter Perkins sent with some tough questions. As I explain below, MTA Acting Executive Director Helena Williams sent him a cordial but most complete brush-off. While Williams may not have been required to have a fiduciary duty to the authority, board members did have a fiduciary duty. And it's questionable whether they followed it in relaxing the terms of the deal with Forest City Ratner for the Vanderbilt Yard, saving the developer $100 million on a replacement railyard, accepting $20 million down for a $100 million cash deal, and giving FCR 22 years, at a generous interest rate, to pay off the $80 million. 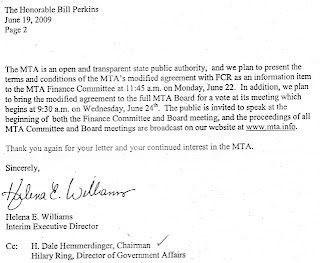 Several days before the hearing Perkins submitted a letter with several “very basic, fair, logical” questions for the MTA. He received a letter, but, as Serrano reported, “it was in fact unresponsive.” Williams refused to answer or acknowledge the questions. The other questions: whether MTA considered that most of the alleged public benefits it considered in 2005 have since substantially diminished or vanished alt ogether? Whether MTA contracted an independent appraiser? What is the current Fair Market Value? Isn’t an appraisal required? What are FCR’s obligations to the MTA if the deal closes but the developer does not proceed with the project? Since the original deal was struck, the commercial lending markets have virtually dried up. The national and local real estate industries have also experienced unprecedented downturns as part of what many are calling "The Great Recession." The downturn in the Brooklyn real estate market and in the economy as a whole has, unfortunately, led FCR to propose significant revisions to terms of the 2006 transaction. The MTA is currently engaged in discussions with FCR concerning their revised proposal and at this time the terms are not finalized. In fact, we are presently in meetings and discussions with FCR in an effort to conclude the terms. In other words, she ignored the questions. That raises some other questions: Could she get away with it? Could her successor, Jay Walder, act similarly? Keep in mind that Walder has been nominated as both CEO and Chair, so he'd also be a board member. I would point out that the heart of the bill that we first put it out... and what is perceived as the heart of the existing reform bill, is the question of fiduciary duty. That is to say, to whom does the authority owe a debt of loyalty, the board members? I took the aggressive legal posture, which was that we had to write it down in statute: you have a fiduciary duty. That’s what the bill this minute says. I worked with a guy named Ira Millstein, who’s a corporate governance expert, and he kept tugging on my sleeve, saying, ‘y’know, they really already have a fiduciary duty.’ So when the MTA statute came up, the speaker and I conferred and we tricked the Senate and governor, and it worked. So what we did in that statute is we added to the list of things for which a board member may be removed: violation of the fiduciary duty. Now the consequence of that is not huge in the legal sense. But it was huge in the political sense--I don’t mean partisan sense--in that it reminded everybody that the board members had a fiduciary duty. On the MTA, where this has just been added, this is going to come up very quickly, because the Nets are going to ask the MTA to take less money for the Nets arena. I believe that the decision to accept that offer would be a violation of the fiduciary duty of the board members. That, however, would require the governor to act. The pending bill, A2209, states that "Board members are required to faithfully obey existing fiduciary duty to the authority and its purposes." Also, it would require the new Authorities Budget Office to develop and issue, after consultation with the Attorney General's office, a written acknowledgement that a board member must execute--either upon taking office or 60 days after the bill becomes law--in which the board member acknowledges that he/she understands "their independence, including their duty of loyalty and care to the organization and commitment to the authority's vision." Brodsky said yesterday that would ensure that the board members' duty is "known and enforced." Brodsky did not testify regarding the MTA board's fiduciary duty, nor has he indicated an intention to examine Atlantic Yards before the fact as he did Yankee Stadium after the fact, but he has expressed skepticism. Take the Seven line extension, take the West Side Yards, take Atlantic Yards. In all those cases, it seems to be me provable that, whether you like the projects or you don't--I'm not taking a position on the projects--that the MTA's fiduciary responsibility to the system and the riders was to maximize the value of the assets it was putting out. It could not do that in many of those cases. That struck me as a violation of the fiduciary duty. But because I passed a law in 2006 that had a mistake in it, we had a CEO of the MTA who was not bound by the fiduciary duty. Now we can fix that. The law gives Mr. Walder a clear defense that, when the next time the Mayor says, "Go build me a subway line to nowhere." Whether he will use that will become, I think, the chief measure of his success or his failure. But it's not simply a question of the CEO's actions. The board could be subject to scrutiny, as well, under the provisions of the existing law, though the pending bill would make such scrutiny more direct.